Since my first PC (an intel 486DX) I started creating / mixing music on a computer. 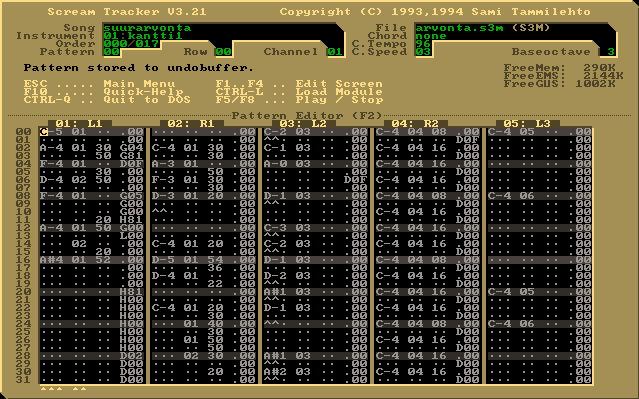 In those days I used a so called "tracker" in which you could create a 4 channel music file. In 1993 scream tracker 3 was released, this was really a big step forward, a good interface with nice playback functions and tracking up to 16 separate channels. With a group of friends we started our own computer music group called San-TX (1996) We created a lot of tracks just for fun, nothing really serious. Later on I joined a couple of demo/music groups (Lethal Agressors, Xcalibur and Revolution ) in which I released a lot of tracks through out some years. Unfortunately the demo / BBS scene kind of died when the Internet became popular. So in 1997 I created a website called The Lost Dimension on which I spread our own music productions, after a couple of years I was the only one left creating music so I kind of went "solo". Years passed while I was struggeling with all kind of techniques for remixing and producing tracks, buying and selling all kinds of equipment, but in the end, one thing never failed me: the pc. Since the beginning of 2007 I also started mashing tracks (combining two or more tracks, into one) The third mashup I created as a sort of a joke (combining Britney Spears with Muse) but got airplay on a national radio station (3FM) So I decided to keep on mashing tracks, and most of them got airplay right away on Radio 3FM and other radio stations worldwide. Even got a request from David Guetta's management to make a sencored version of my mashup god is a memorie so they could broadcast it in the USA. In January 2008, I got in contact with a DJ at a local radio station called Radio Moerdijk which was looking for a guy who could provide dance mixes for his show. Since I already was creating dance mixes we decided to make it a monthly event. So every last friday of the month my FreakpowerMixes were broadcasted. After 18 editions I decided to quit this monthly commitment and just mix whenever I felt like mixing.